Wheat growing at Four Star Farms in Northfield. NORTHFIELD — Buying local food — from vegetables to eggs, meat, and even honey — has moved into the mainstream. But what about a staple like flour? Is there any reason to seek out flour milled from grains grown in the Northeast? Talk to some farmers, chefs, and bakers, and they’ll tell you that the payoff is in the flavor of flour freshly milled from heritage varieties grown nearby. Although Northeast grain farming is on a tiny scale compared to the thousands-of-acres farms in the Midwest and Northwest, vegetable farmers such as Noah Kellerman of Alprilla Farm in Essex think grain fills a gap in the local farming system. Plus, he adds, his CSA and commercial customers love the flour he mills himself. On a chilly day earlier this year, Kellerman stood in a plot of less than an acre where winter wheat spread like crabgrass, looking nothing like the vision of waving fields of grain most would picture. But the roots of these grasslike plants spread underground through the winter, says Kellerman, and by summer grow to produce distinctive heads of grain, reaching about waist high when ready for harvest in mid-July. The flavor of this Warthog winter wheat can change the way bakers feel about flour, he believes. Liz L’Etoile of Four Star Farms, a grain and hops farm in Northfield, argues that the aromatics and flavors of locally grown and freshly milled flour make a huge difference in baking. Chef Ana Sortun, who uses Four Star’s flour in her breads at Oleana and Sofra, agrees. “Definitely it’s a revelation,” Sortun says, adding that the sweetness and nuttiness from flour grown in Massachusetts add a complexity to the simple breads she serves at Oleana. Regionally grown and milled wheat flour, stoneground cornmeal, and gluten-free buckwheat are increasingly available at groceries, specialty stores, and by mail order, and in breads sold by bakeries and served in restaurants. Many small growers sell grains and flours at farmers’ markets all over New England. To a home baker or chef accustomed to taking flour for granted — white, unbleached or wheat — choosing varieties such as Warthog, Glenn, Zorro, or Flint cornmeal seems exotic. And the cost can be substantially more. But to some chefs, it’s worth it. Sortun gives an example of yufka, a Turkish bread that is made only of olive oil, salt, and flour, featured at Oleana in Cambridge. “When you’re making something that relies on those three ingredients” and the result from a Bolted Glenn variety has amazing flavor and complexity, Sortun says, you start to realize that bread “does not have to be just a blank slate. “Danielle Glantz, who uses Alprilla Farms’ flour in her handmade pasta in Pastaio Via Corta shop in Gloucester, is so enthusiastic that she asks a visitor to smell Warthog winter wheat to prove the scent is like almonds. Four Star Farms, which started as a sod farm 30 years ago, has expanded its grain acreage over the last eight years to 150 acres. L’Etoile, who runs the farm with her in-laws, says wheat harvest will be in mid-July. “We get some really tremendous flavor profiles,” she says of the flour and wheat berries sold to Oleana, SRV, Asta, Forge Bakery, Sofra, and other restaurants and bakeries, and retail sales to Formaggio’s in Cambridge, City Feed & Supply, and other retail outlets as well as online. Right now grains milled at the farm were grown in the summer and had a good protein level of 13 to 14 percent for bread baking. The turnaround time from harvest to sales is months. Four Star Farms mills 300-500 bushels a week, and the small-scale production allows the L’Etoiles to control freshness since the grains and flours are distributed soon after milling. In Essex, Kellerman of Alprilla Farms grows small amounts of wheat and corn on a few acres to supplement his winter CSA and sells to A & J King Bakery in Salem and Pastaio via Corta as well as CSA and farmers’ market customers. “I’ve always wanted to grow it,” says Kellerman, and the flour brings in income in the winter. Kellerman planted his two plots in Warthog in the second week of September. Four Star grows both winter wheat and hard red spring wheat, such as Four Star’s Glenn, which is planted in late April to early May and harvested late in July. 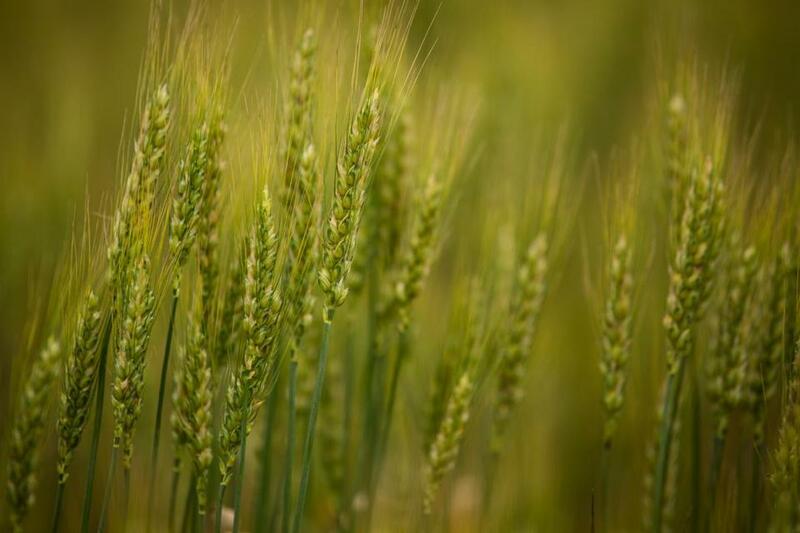 Although the growing time is shorter, wet conditions in New England summers can affect the grain quality, making spring varieties sometimes less reliable. Unlike commodity wheat that is processed and mixed to ensure uniform flour, local wheat products can have varying protein yields. Last summer’s crop, for instance, gave Kellerman high yields per acre but low protein — only 7 percent compared to 11 percent or higher, requiring bakers to use less water and add some white flour for bread. Jack Lazor of Butterworks Farm in northern Vermont has been growing grain along with making yogurt for more than 40 years. Although he believes grain farming in New England is viable, he says it’s best done with other agriculture, such as legumes and cover crops to protect the soil. His “The Organic Grain Grower” is considered the bible of Northeast grain growing. “The heirloom varieties (grown in New England) have a deeper root system than commercially-grown wheat.” That, he says, leads to a flavor profile that can’t be matched by commercial flour.